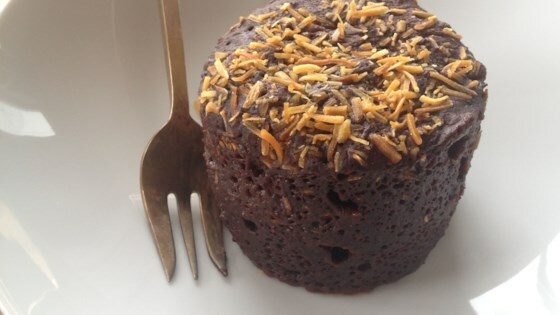 "This vegan mug cake is made without egg or milk and uses applesauce for moisture. Within 5 minutes you have a great vegan dessert for 1!" Combine flour, sugar, cocoa powder, and baking powder in a mug. Stir applesauce and soy milk together in a bowl and add to flour mixture. Stir until well combined. Fold in chocolate chips and sprinkle with coconut. Microwave at the highest setting until mug cake has set and risen well, about 3 minutes. nice easy and fast recipe for one or two people.Cake tastes pretty good and a scoop of ice cream on top doesn"t hurt.